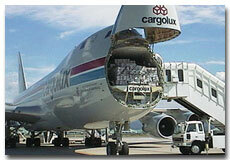 Cargo Airlines are the airline that is dedicated to the transport of Air Cargo Service. Cargo Airlines are also called as Airfreight carriers. Some cargo airlines are divisions or subsidiaries of larger passenger airlines. It tends to use new or recently built aircraft to carry their freight. A Cargo Airlines is an airplane designed and used for the carriage of goods, rather than passengers. A number of air cargo transport airlines carry a few passengers from time to time on their flights. Generally the structure of air cargo carrier airlines planes includes a high wing to allow the cargo area to sit near the ground. It consists of a high mounted tail that is used to drive the cargo directly on and off the loading cranes or trucks. So many wheels are there in a cargo plane to allow the plane in a larger number of locations. Initially the airlines cargo planes were used to deliver airmail to different places of the world. Now the aviation industry has made the cargo transport more feasible with wide use of cargo airlines planes today.